Does anyone know where I can find the report which states that no more new diesel buses will be ordered? One thing you may notice on page 96 is the T charge from 27th October, unlike the congestion charge buses don't get exemption if not euroIV, therefore any euroIII buses straying into the congestion / T charge zone need to pay T charge. I would've thought that all remaining euro3 engine buses under TfL are no longer euro3 spec'd at the pipe following various treatments. New Customer Service Panel papers are up. 2 noteworthy papers this time. - the regular Customer Services report. Reports on bus patronage number creeping up by a tiny percentage. Also improvements to running times / reliability everywhere except SW London where works in Kingston prevented any improvement. The report also has an appendix setting out forthcoming consulations for Quarter 3 - only minor ones affecting bus services including Bus 372 at Rainham and the withdrawal of route 965. Proposals for Oxford St are also to be consulted on that may have much larger consequences for buses. - a paper on Accessible Transport. Sets out a range of initiatives and research findings. TfL are still looking to review internal bus layouts to create buggy *and* wheelchair spaces. The research also cites that "slow bus journeys" are now a new and major concern for people with accessibility issues. The Period 6 Finance Report went to the Board this week. Looks like the Buses are doing better against *budget* than expected. All the other modes (except DLR and Trams) are performing worse than budget for revenue on the year to date basis. The matters arising paper (last meeting) indicates a number of interesting sounding strategic papers have a target date of The upcoming meeting on 24 Jan. probably give something for Snoggle to get his teeth into and fume. Annoyingly the Hospital routes review is due in the Spring, but there isn’t a meeting then so this may remain hidden. That Technology paper is full of interesting stuff. Looks like there is a bit of a IT crisis in Buses. Several key systems that manage schedule and other information that is used to cross check / validate I-Bus actual performance data are obsolete. These systems all need replacing - you can tell it's urgent because there is the usual client's trick of "the world will end and we will be forking out loads of cash" has been deployed As you say the Bus radio system is knackered and needs urgent replacement too. There is also a shed load of fascinating ticketing stuff including a new card reader with first deployment on buses, new rail fares calculation software, automation of variable Oyster price routes, a new revenue inspection reader device, system charges to "force" people to surrender their 1st generation Oyster cards, extra fares calculation for Crossrail fares and various other things that are very intriguing. It also looks like the planned Future Ticketing Project Phase 5 (to give monthly capping) has been abandoned - no money is shown in the budget. EDIT - In the Q3 Investment Report there is this commentary about the euro6 upgrade to the bus fleet. It is being done by "low emission" corridor. Note the remark about euro5 NB4Ls - I suspect we will see any surplus buses from route cuts being used a float for several months to allow an accelerated euro6 conversion programme to meet the ULEZ deadline. This will delay any possible route conversions to NB4L. Currently, there are 1,600 single-deck and double-deck ULEZ compliant buses in service. The red 2017/18 budget milestone RAG relates to the Mayor’s November announcement of an earlier introduction of the central London ULEZ from September 2020 to April 2019, which now requires all Euro V New Routemaster buses to comply with a Euro VI emissions standard. When the ‘75 per cent of the buses operating in the ULEZ will be compliant’ milestone was set, all 306 Euro V New Routemasters were specifically considered to be ULEZ-compliant. We continue to install NOx abatement equipment on buses. The Brixton/ Streatham Low Emission Bus Zone has been completed with 235 compliant vehicles now contributing significantly lower NOx emissions on that corridor. The A12 Eastern Avenue corridor is 91 per cent complete and the Haringey Green Lanes corridor is 39 per cent complete. We are starting to retrofit NOx abatement equipment on buses on the A21 Lewisham Catford and Stratford corridors. More than 580 buses have been converted to date and these are also directly delivering benefits for the Mayor’s programme to improve air quality. The Brixton/ Streatham Low Emission Bus Zone has been completed with 235 compliant vehicles now contributing significantly lower NOx emissions on that corridor. snoggle are they 100% sure about this because I'm sure there are still non compliant vehicles running along the corridor. I am merely the man "cutting and pasting". I have no means to verify any remarks in the report. As TfL have for years said Oyster cards can be used for years, I wonder how exactly they intend to force people to change the older (first generation) cards. So person gets on bus, does Driver call special Code Oyster team who wizz along and politely swap your card and transfer the credit? Apparently newer cards have a D before mayor of London so will have to look sometime. Out of interest how do you tell which generation Oyster card it is, it’s light blue colour, is there a list of serial numbers or something? Do you have a first-generation Oyster card? 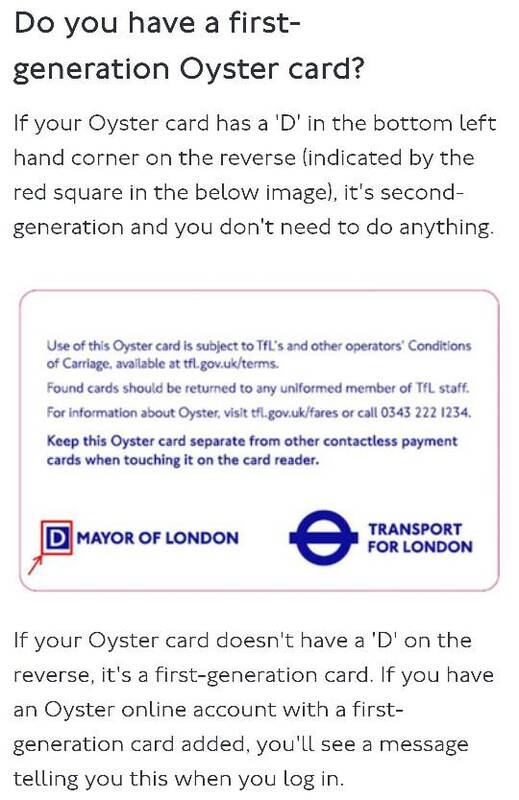 If your Oyster card has a 'D' in the bottom left hand corner on the reverse (indicated by the red square in the below image), it's second-generation and you don't need to do anything. If your Oyster card doesn't have a 'D' on the reverse, it's a first-generation card. If you have an Oyster online account with a first-generation card added, you'll see a message telling you this when you log in.